Last week, I flew out to Tokyo with about 12 hours of notice. I ended up having to stay through Labor Day weekend, and I’m sure you can just imagine how Ruth felt about that. Fortunately (for me), Tokyo is by far one of my favorite places I’ve traveled to for work. This sprawling metropolis offers Japanese culture at its finest. You can find rich history, incredible food, and tons of things to see and do. I did have a couple of days to explore while I was in Tokyo. In case you’ve missed my other “workaholic’s” posts, this series features my recommendations for fellow business travelers who might only have a couple of hours here and there to explore. (See Hong Kong, Paris, and Versailles). I also include a quick and efficient hotel workout because I know I’m not the only who can pass up gourmet foreign cuisine. Today, I’m talking about burnt ramen and Japanese baseball. For more Tokyo recommendations, see our top picks from our trip last fall. Forget what you thought you knew about experiencing a baseball game. 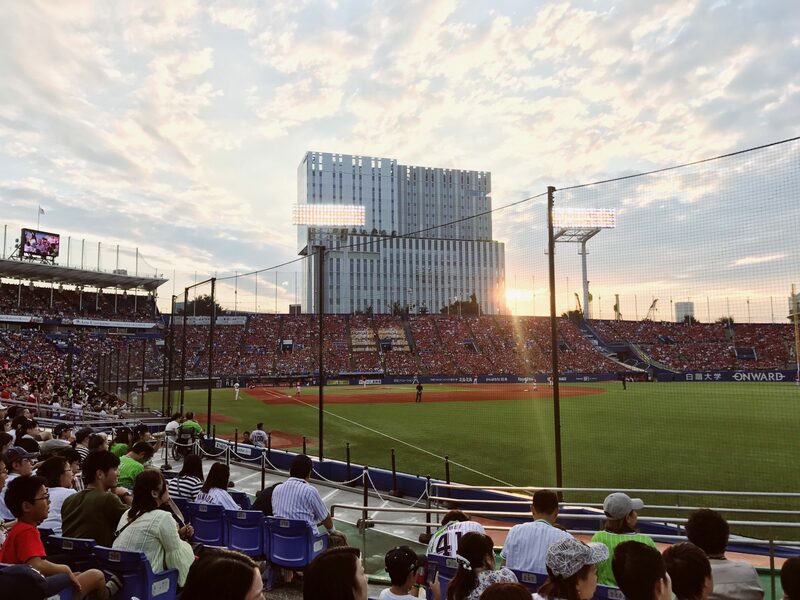 Contrary to the slowly cooling enthusiasm surrounding baseball in the states, baseball dominates popular culture in Japan. Baseball games in Japan are insane. If your schedule aligns with baseball season, this is an absolute must. There are five pro teams in the Tokyo area (the most popular team is the Yomiuri Giants). On the Sunday I was in Tokyo Tokyo Yakult Swallows hosted the Hiroshima Carp. It was a no-brainer. The Carp versus the Swallows? Duh. Expect nine innings of true fan pandemonium. Both teams have their own band- think college football- and the fans sing in unison to team chants. It’s something you have to see in person to really experience. Every fan has a plastic bat for noise-making in one hand and an umbrella in the other which is both functional on a hot or rainy day and perfect for cheering a home run! I would absolutely recommend the Tsukada Nojo Stand for your game time meal. It may have a long line, but it’s your best option to have a semi-authentic Japanese meal at the stadium. (please, please avoid the KFC’s). If you’re concerned about how to get beers, that’s the least of your worries. Vendors walk the bleachers with kegs mounted to their backs for your convenience because how else would it work? If you’re REALLY feeling the baseball theme, head to the Meiji Jingu Gaien Batting Cages, just around the corner from the Meiji Jingu Stadium. Whether you are looking for some fun before the game or just trying to burn some pent up business trip anger, this is your place. Tokyo is full of incredible food around every corner. The Roppongi area is a great place to stay because there are so many options within walking distance. I was able to eat at a lot of great spots, but my favorite was the burnt miso ramen at Nishiazabu Gogyou. “Burnt” means that the cook will light the batch of broth and noodles on fire, which is quite a sight from your table. This may have been the best ramen I’ve ever had. Needless to say, I went twice and savored every bite. There is an inconspicuous sushi restaurant in the Narita Airport Terminal 1 that is the exception to my rule. I ate the best sushi I’ve ever had at Sushi Kyotatsu. It is not the cheapest meal, but heck, this is your last meal on your company’s dime. Go nuts.